So I find myself in a bit of a rut in regards to coffee. I consistently drink good beans. I make espresso and drink it whenever it pleases me. However recently I became lactose intolerant to a level I couldn’t ignore. If you want to know the nadir position I drank a cappuccino in my last video review, it tasted wonderful. But it hurts to type that, because I spent the next two days doubled over in pain. So, while I have been drinking my coffee black as a matter of pride, for years. I feel disconnected from the coffee world online. With beautiful latte art, and enticing cappuccinos and their friends I’m feeling a bit out of sorts. This isn’t a pity party I’m just trying to find common coffee grounds to get enthused about once more. I don’t need milk, ice cream or anything else in my life (I do miss cheese though) I just miss having the options. 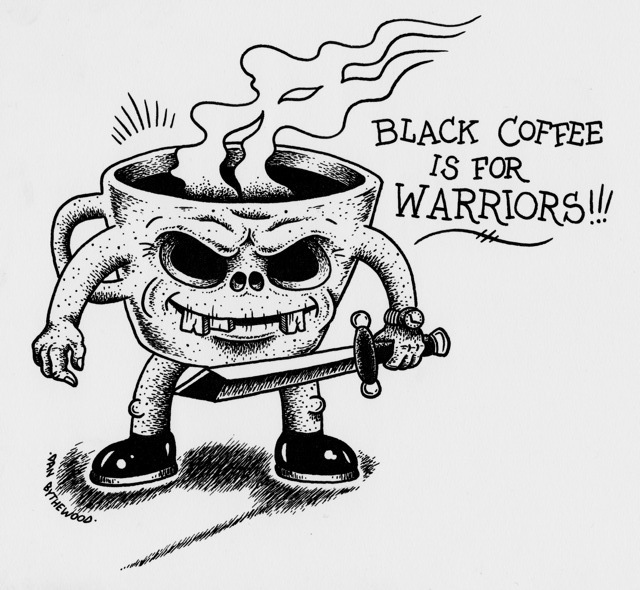 This is my favorite illustration I have found about black coffee is from DanBythewood, and sums up how I feel about the beverage. So we soldier on!